The 1877 schoolroom was designed by G A Mansfield, Architect to the Council of Education. It is an example of neo-Gothic architecture and its church-like appearance reflects the strong link between religion and education of the time. Its high walls and gabled ceilings, originally with dormer vents, provided ventilation. Light was provided by the windows with the larger windows strategically located on the northern side to provide light over the pupils’ left shoulders. At the time pupils were made to write with their right hand, hence no shadow fell on their work. The windows were situated high to minimise distractions and were originally coloured or frosted to reduce glare. Heating was provided by the open fire which would most-likely have been coal-fuelled. This was maintained by the teacher as was the cleaning and basic maintenance of the room. The room has been authentically furnished with early public school furniture. The cupboard (book press) and teacher’s desk are Australian red cedar whilst the long-toms (desks) are pine with one date-stamped PS1881. An original red cedar and pine dumbbell cabinet contains four removable drawers each holding one dozen pairs of dumbbells. Built as a single schoolroom, pupils from 1st to 5th Class were taught collectively by one teacher, often assisted by a pupil-teacher (trainee). This was the full range of classes at the time with pupils leaving school, usually for full-time employment, by the age of 13 or 14 years. The 1st Class students sat in the infants gallery writing on slate boards perched on their knees. 1st Class pupils would have spent 18 months in this area. Learning was by rote with pupils drilled in the 3Rs: reading, writing and arithmetic. The teacher taught from the front of the room so the stepped floor provided a better view for both the pupils and the teacher. The timetable and syllabus was prescribed by the NSW Public Instruction Act of 1880, and Regulations, with Instructions to Teachers. For hand washing, a wash trough was located on the end of the open verandah outside the room with water provided by a cube-shaped steel ship’s tank, now reinstated. This tank, measuring 4’x4’x4’ could hold 400 gallons of water. The roof was originally covered in shingles, which stained the water, and so the pupils often had to bring drinking water from home. The sandstone footings of the building were quarried locally from a ‘fine grey-stone quarry’ situated on a nearby ‘fifty-one acre farm’ (SMH 30-11-1878). The second room, joined onto the back of the 1877 room, was designed by W E Kemp and built in 1893. He successfully blended the old with the new but added his own details such as a boarded ceiling with a large round air vent and an Italianate barge board. The enclosed verandah was also built at this time, providing internal access to both rooms. The verandah has been reinstated using original building materials acquired from the demolished Marsfield Public School. The layout and furniture of the 1893 room was similar to the 1877 room with stepped floor and open fire with the pupils faced towards the fireplace. The window sills were originally a similar height to those in the 1877 room. In 1986, the eastern end of this room was partitioned off to provide kitchen and toilet facilities for district office staff. These remain and the rest of the room is currently used as the museum’s office. 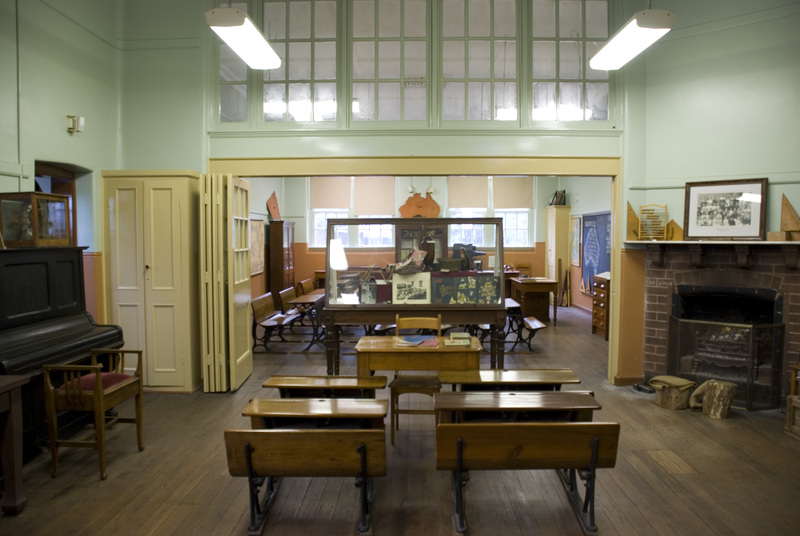 With increased enrolments, in 1910 two additional rooms and a corridor were added to the side of the 1893 room. Significantly different to the first two rooms, they reflect the new ideas in education of the time. The New Syllabus of 1905 provided for Kindergarten work, a wider range of subjects, reformed teacher training, and the provision of secondary schools. Separate classrooms were established, stepped floors levelled, window sills lowered and new furniture installed. These renovations were undertaken to the 1893 room when the 1910 rooms were built. 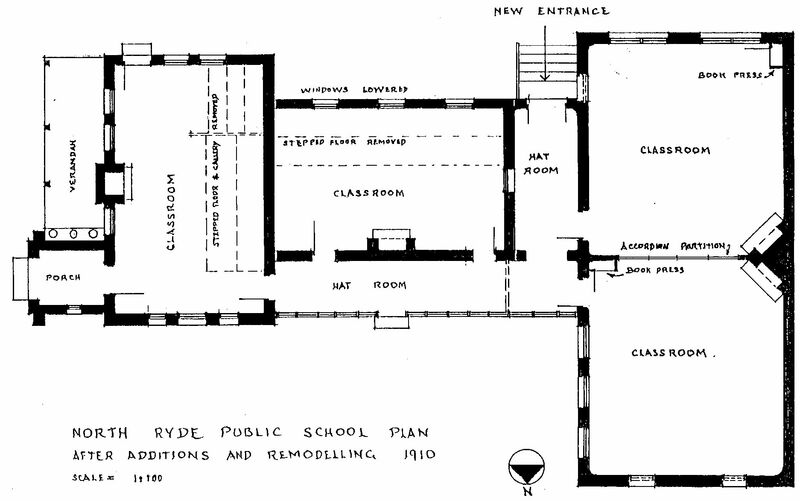 The two 1910 rooms represent what was then the ‘ideal’ in classroom design. There was an emphasis on providing an efficient and hygienic interior. The walls are plastered and internal corners rounded to prevent dust accumulating and make cleaning easier, cupboards (bookpresses) are built-in and large windows provide more light and cross-ventilation. The concertina partition between the rooms blocked sound but permitted light. Open fires, fuelled by coal, provided heating. Lighting was by gas light on poles from the ceiling until electric lights were installed in 1936. The original electric lights were single bulbs in domed glass shades. These have recently been reinstated, increasing the authenticity of this room. Heritage-style fans have been installed in these room to improve comfort for visitors but were not an original feature. 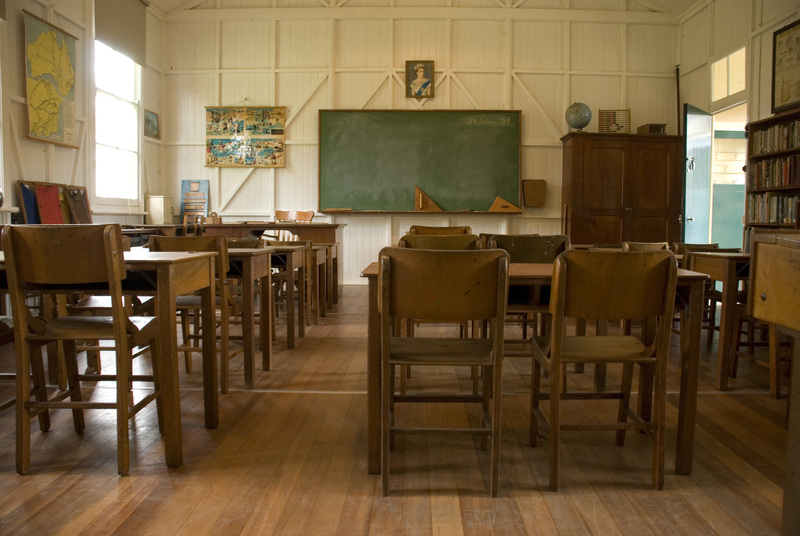 The furniture in these rooms is all original public school furniture and includes timber and iron dual desks, teachers’ desks, a headmaster’s desk, a large infants table, timber-slatted infants chairs and a silky oak circular table. 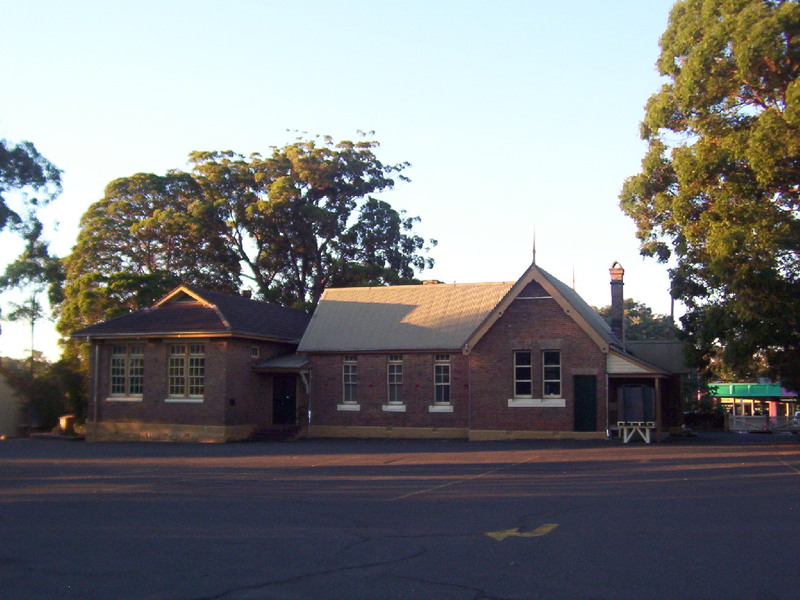 Not an original building of North Ryde Public School, this demountable block of two unlined weatherboard classrooms was relocated to the site from the former Department of Education’s furniture complex. The building is located on the site of the original schoolmaster’s residence. One of these rooms has been furnished as a 1950s/60s classroom with timber desks and chairs. The rooms are available for hire by film companies. Location hire page. The teacher’s family lived on site in this four room cottage. It stood where the timber classrooms facing Cox’s Rd now stand. There is a sinking circular depression in the grass beside where the schoolmaster’s residence once stood. We think it might be the original brick-lined water cistern that supplied water to the cottage.